Trevor Robinson will no longer play guard for Notre Dame. Instead, head coach Brian Kelly envisions his talented offensive lineman as a better fit at tackle -- at least for now. Robinson arrived at Notre Dame as a decorated high school All American, coveted by many high profile programs. To date, Robinson, like each of his linemen teammates, has been somewhat of a disappointment. Taking over for Robinson at right guard will likely be sophomore Chris Watt. The former five-star lineman from Illinois brings an immense amount of potential with his sudden rise up the depth chart. However, as Irish football players and fans alike are learning, a permanent place on Brian Kelly's fluid depth chart seems a terribly difficult thing to achieve. 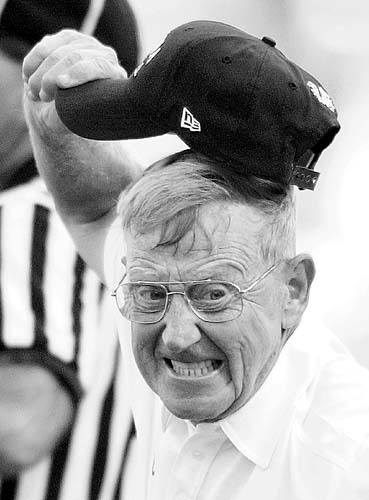 Moving players from one position to another will remind longtime Irish fans of former head coach Lou Holtz (photo). During his 11-year reign in South Bend, Holtz quite successfully managed to shuffle his roster, identifying which position most suited his players. During Brian Kelly's first few months on the job he has switched several players to new positions. Former tailback Theo Riddick, lauded as a future star by previous head coach Charlie Weis, is perhaps the most intriguing. Riddick's speed will now make its way toward the wide receiver position where he will attempt to make an impact at the slot receiver position. While Kelly tinkering with his roster will conjure reminders of Lou Holtz, his spread offense could not be anymore different than Holtz's bleed-the-clock physical brand of offense. And with a roster steeped in talent, we should know soon enough whether Kelly can achieve and sustain a similar level of success.